Imagine a book that teaches you not only how to identify and harvest wild edibles, but also how to prepare those plants into mouthwatering recipes. Now, imagine if that book were a feast for the eyes as well, showcasing beautiful hand-drawn and painted, scientifically-accurate illustrations of the plants you’re foraging. 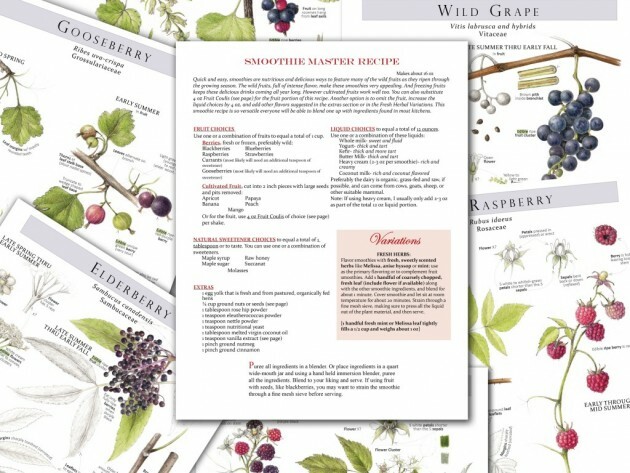 Now, imagine if the recipes weren’t just one recipe each, but master recipes that can be adapted in more than 40 different ways depending on the particular plants and quantities you foraged. My friends! Such a book exists. I have it in my hands at this very moment. 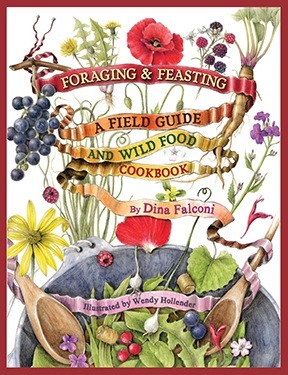 It’s called Foraging & Feasting – A Field Guide and Wild Food Cookbook. And this week, I’m giving away a copy to one of you lucky readers! Written by Dina Falconi and illustrated by Wendy Hollender, this book is an absolutely stunning addition to any home. But you won’t find it in many bookstores. That’s because the author and illustrator are selling through their own publishing company rather than large distribution channels. You may still find it in independent book stores, but chances are good you’ll want to special order it through your local retailer or order it online directly from the publisher. Foraged foods are free. They require no inputs or cultivation. 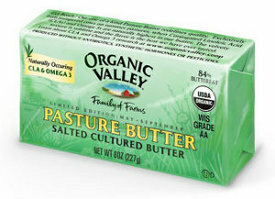 And, foraged foods often have superior flavor and nutrition to cultivated foods. That’s because cultivated fruits and vegetables are created to hold up to mechanical harvesting, cold storage, shipping long distances, and to look beautiful on store shelves. They’re not cultivated for depth of flavor or nutrient-density. Foraged foods provide a great way to opt out of the industrial food supply, and Foraging & Feasting – A Field Guide and Wild Food Cookbook makes it easy to harvest and prepare these foraged foods in delectable, hearty recipes. Watch this video about Foraging & Feasting. How to win a copy. Just use the Rafflecopter Widget below to enter. The winner will be announced on December 31st, 2013. 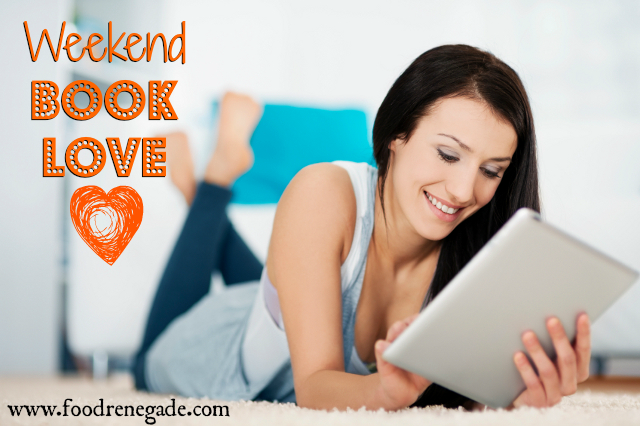 This is the 9th in a weekly Weekend Book Love Series (see them all here). Next week, I’ll be reviewing Paleo Sweet Tooth by Allison Russo. G’day! Foraging for food has always fascinated with me, true! I pre-ordered this book for my Mom for mother’s day and ordered one for myself at the same time. It is a beautiful well-illustrated book and easy to follow due to all the wonderful pictures. I have a good friend who would absolutely love this! Thanks for the great giveaway. I need this book in my life. OMG. Would really enjoy cooking with this book. Time to try something new. Tweeted… I couldn’t get the Facebook share thingy to work. Would love to have this book! I am learning about wildcrafting for medicinal use and this book would be a great companion. Not a comment a question. Recently received Meyer lemon oil—–does it need to be refrigerated? Rafflecopter won’t open. My loss. Would have been interesting reading. What a wonderful book to own. Books with this kind of knowledge can be a life-saver in time of necessity. I’d love to have it and thank you for the opportunity. We do video blogs on how to do all this! We will be doing one soon on edible weeds in the city & urban beekeeping! In Australia we sometimes call food ‘tucker’ – hence our name! Love your blog & work! So we are very interested in this book!!! This book is beautiful! I’d love to have it. This topic of foraging for wild herbs and greens has always fascinated me and I would so enjoy learning more about it. Thanks for your website and for the opportunity to win such a prize! Excited about this book! Great resource to have. Fascinating idea. I started watching what I eat lately and definitely eating a lot more raw vegetables. Include eating Kimchee and Sauerkraut. I don’t get acid reflux anymore. I like this idea a lot, because, there is so much we modern people, who have given up our will to the modern corporate processed diet, have not seen improving health conditions, we are seeing more health problems. We need to be smart about the choices we make, it’s not to late. I will buy your book and put it on my tablet, I hope you have a tablet version. If not, I’ll tuck the book in a cover of some sort. I hope that you’ve had a very Merry Christmas and I hope that you have a Blessed, Happy and Prosperous New Year.